The Potomac Nationals return from the first road trip of the season next Thursday to start a split seven-game homestand at Northwest Federal Field at Pfitzner Stadium. The P-Nats will face the Winston-Salem Dash (Chicago White Sox) for four games, enjoy a day off, then play the Salem Red Sox (Boston) in a three-game series. 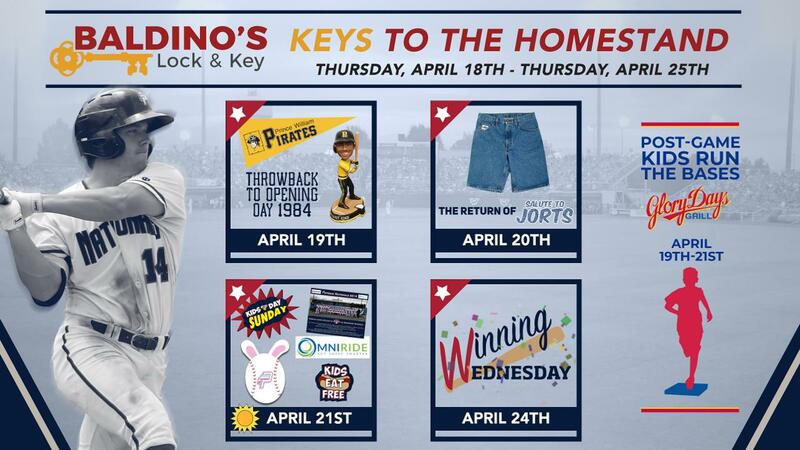 The homestand will be highlighted by a throwback Barry Bonds Prince William Pirates Bobblehead giveaway, the return of Salute to Jorts Night, a meet-the-team autograph session with a team photo giveaway, Easter Sunday and Winning Wednesday. -Throwback to Opening Day 1984: The Potomac Nationals GMs, Bryan Holland and Aaron Johnson, will cut a ribbon to open the gates, and fans will be able to walk through the original ballpark turnstile to enter the ballpark, see a display of 1984 era memorabilia, and catch 1984 trivia on the videoboard. -Return of Salute to Jorts Night: Celebrate the best kind of shorts! Show up wearing jorts, as any fan who wears them can purchase a discounted grandstand ticket for $5. If you don't have jorts, don't worry, as there will be a Leg Liberation Station to cut jeans into jorts. During the game, there will be a "Best Jorts" competition, as well as famous jorts appearing on the video board. -Pre-game Team Autograph Signing, presented by OmniRide: meet the P-Nats during an on-field, pre-game team autograph session running from 12:05-12:25pm. -Easter Sunday with the P-Nats: Kids can hunt for eggs in the outfield post-game and also meet the Easter Bunny. There will additionally be an in-game Easter egg hunt, with eggs hidden throughout the ballpark. Plus, guess how many jelly beans are in the jar at Fan Assistance, with the winner receiving an Easter basket filled with goodies! -Kids Eat Free: The first 200 kids 12 & under will receive a free hot dog and soda. -Caricature Artist: Fans can stop by the concourse, where an artist from Manis Creative will be set up (charge applies). -Military Appreciation Jerseys, presented by Northwest Federal Credit Union: The P-Nats will wear these on select games throughout the season to recognize local military members and to thank them for all that they do for our country. They will be auctioned off on August 25th, with proceeds benefitting Women Veterans Interactive. -Virginia529 Super Saver Sunday: Show your Virginia529 Smart Savers Club Card at the ticket office to receive two free grandstand tickets to the game. -Winning Wednesday: The P-Nats will host Nine Innings of Winning, where one lucky fan will win a prize each inning. Then, if the P-Nats win, fans can redeem their ticket for one of equal value to the next Wednesday home game (5/15). -Baseball Bingo: Fans can pick up a card at Fan Assistance on their way in for a chance to get a bingo and win a prize.